Through FairLifts associated helicopter providers, you can outfit your respective Virginia pipeline network with all of the tools it needs to succeed for the long run. Thanks to affordable helicopter packages in the American east, you can enjoy an instantly increased output, while you expedite ventures in a fraction of the normal time. Helicopter pilots comply with any and all FAA regulations, whether they are transporting personnel, streamlining emergency response services or locating potential leaks. Through a helicopter provider in Virginia, a sustainable pipeline inspection advantage is good as yours. Given that it plays host to so many oil and gas pipelines, Virginia is the deserving home for optimal flight conditions. Large periods of ideal weather during summer and spring months give way to colder temperatures come wintertime, but even when climatic conditions are less than ideal, choppers enhanced specifically for weather can nevertheless accomplish pipeline packages to your satisfaction. With more than 3,000 miles of total natural gas pipelines, and an additional 20,000 miles of miscellaneous pipelines, it’s high time for a better way to service the networks themselves. Helicopters bring a high-grade solution, with affordable costs and highly experienced providers. Don’t allow your competition to keep you from performing at peak, optimal output. It’s time that you put a widespread variety of dependable pipeline services to work in Virginia, where enhanced helicopters routinely take to the skies in back for the immediate and lasting satisfaction of our clientele. No matter your financial parameters or your individual or corporate preferences, their promises to exist a unique helicopter option that can perfectly accommodate your respective interests. 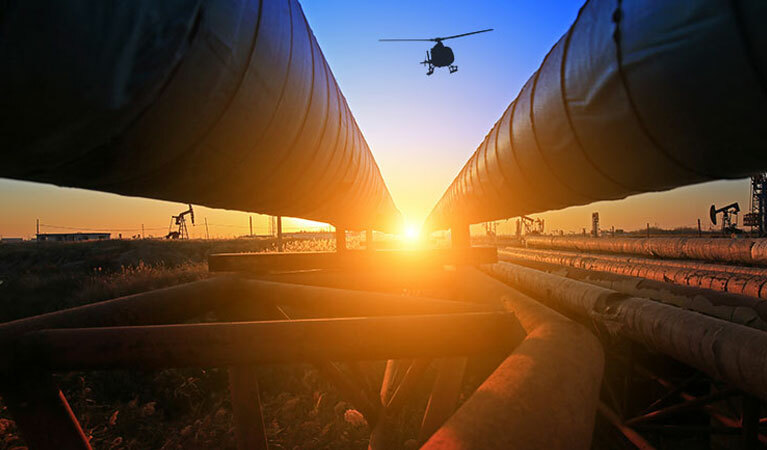 Learn to trust the states top helicopter providers, who will help you to realize increase productivity at any one of your Virginia pipeline inspection locations. Perform holistic pipeline inspections and surveys alike from any low or high-altitude location. In Virginia, you can inspect the complete extent of your pipeline thanks to advanced helicopter metrics, at the same time performing site surveys while you leverage the vertical element in a chopper for your gain. Keep track of all of your cargo shipments for any and all onshore and offshore deliveries, thanks to the helicopter-enabled pipeline cargo shipment packages. Regardless of the weight or the load itself, a helicopter can effectively accomplish cargo and freight deliveries in a fraction of the traditional time. Whenever time is short, put your pipeline in good hands with emergency response assistance provided exclusively by helicopter providers in Virginia. Helicopters can expedite your search and rescue, evacuation, or other miscellaneous emergency procedures. And locate prospective leaks faster than ever before, with advanced leak location assistance helicopter packages. Keep your crew members functioning at optimal capacity at all times, when you free or personnel up for constant transportation thanks to crew transport packages by helicopter in Virginia. It’s easier than ever to keep workers at necessary locations, given a helicopter is capacity to transport workers quickly and effectively. Don’t hesitate another second before reaching out to one of our customer service agents today! We can help answer any of your remaining questions, before helping you to book a pipeline inspections package for Virginia employment. Find yourself enjoying increased output at any one of your Virginia pipeline locations, thanks to the unrivaled, affordable prowess that helicopters alone provide in the region. Discover everything that a helicopter brings to the table today when you call FairLifts, or when you fill out a customer contact form online, for an expedient response within 24 hours. Alexandria - Arlington - Charlottesville - Chesapeake - Fairfax - Falls Church - Fredericksburg - Hampton - Henrico - Lynchburg - Manassas - Midlothian - Newport News - Norfolk - Portsmouth - Richmond - Roanoke - Springfield - Virginia Beach - Woodbridge, and more.